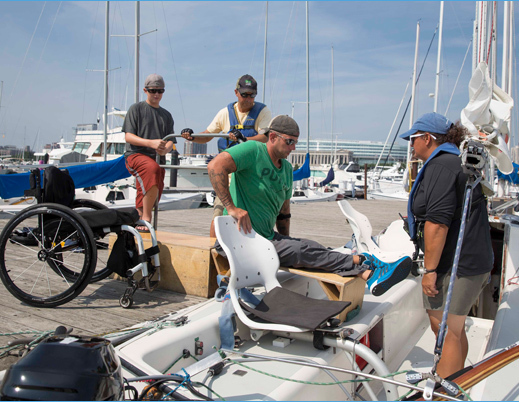 Our adaptive program includes classroom and on-water instruction for the physically disabled. JGASP is a public/private partnership with the Chicago Park District whereby the Foundation raises funds for instructor salaries, boats and maintenance costs while the Park District is responsible for the infrastructure. The fleet consists of eight Freedom 20’s, eight Sonars and four 2.4 meter sailboats. 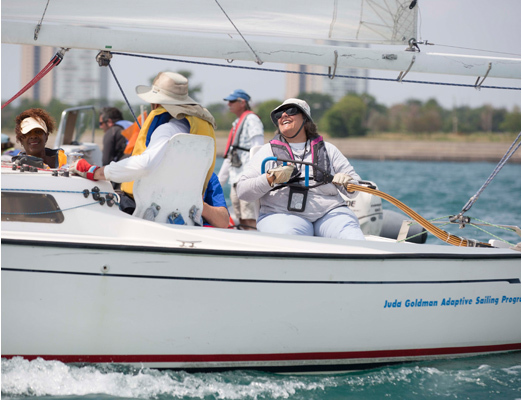 The Freedom 20’s were built specifically for disabled sailors and have many safety features that make this boat the premier boat of choice for a disabled sailing program. The Sonar and the 2.4 meter boats are for more advanced racing sailors and are used in world disabled championships, such as the Paralympics. All boats are very stable and will not capsize. Transfer-boarding benches that assist sailors as they move from wheelchairs to seats aboard. 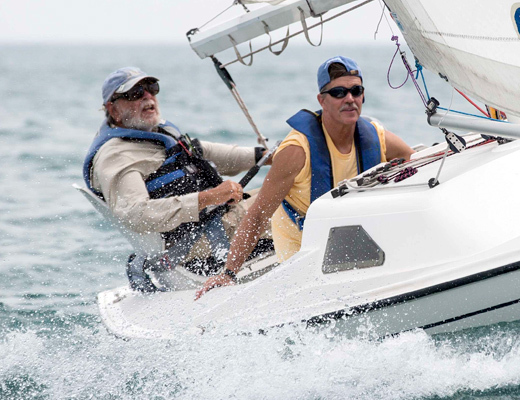 Fifteen (15) hours of instruction (six 2½ hour lessons) are available for beginner and intermediate sailors for $100.00. A one-to-two instructor to participant ratio is emphasized; however, each participant can bring a friend along for the lesson. Participants are eligible for crew certification after completion of 15 hours of instruction. Lessons are offered Wednesday through Sunday. Phone reservations can be made between the hours of 9:00 a.m. to 5:00 p.m. Scholarships are available based on financial needs. Applications can be obtained in person at the Sailing Center. Several fun cruises are planned each year and the round-trip includes lunch. Please call the Sailing Center at (312) 747-7684 for reservations and costs. Group lessons for organizations can be scheduled based on availability. For details, please call the Sailing Center at (312) 747-7684. Take I-94 W to exit 53C. Merge onto I-55 N/Stevenson Expy N towards Lake Shore Drive. 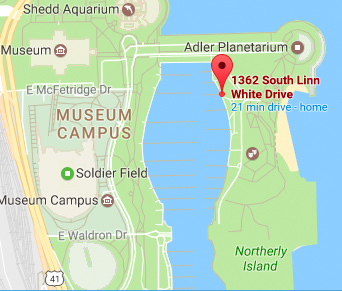 Exit onto S. Lake Shore Drive. Turn Right at E. McFetridge Drive. Turn left at E. Solidarity Drive. Turn right at S. Linn White Drive. Take Tri-State Tollway/I-94 S ramp to Indiana. Take exit 53 to merge onto I-55N toward Lake Shore Drive. Exit onto Lake Shore Drive. Turn right at E. McFetridge Drive. Turn left at E. Solidarity Drive. Turn right at S. Linn White Drive. Take I-290 E/Eisenhower Expy E to I-294 S/Chicago. Take I-90/I-94 toward Indiana. Merge onto the Dan Ryan Expy (I-94/I-90). Take exit 53 to merge onto I-55N toward Lake Shore Drive. Exit onto Lake Shore Drive. Turn right at E. McFetridge Drive. Turn left at E. Solidarity Drive. Turn right at S. Linn White Drive. Take I-94 W to the Townline Road/IL-60 Exit. Go East on IL-60. 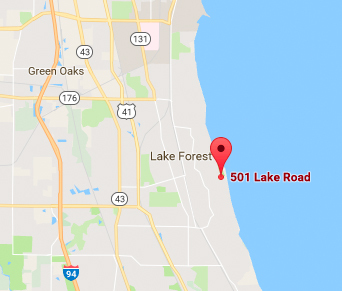 Turn Left onto Waukegan Rd. Turn Right onto W Deerpath Rd. Turn Right onto Lake Rd. Take Tri-State Tollway/I-94 E to IL-137/Buckley Rd. Turn Right onto US-41 S. Turn Left onto Deerpath Rd. Turn Right onto Lake Rd.